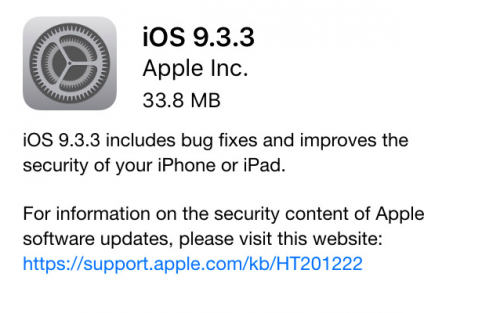 Apple has just released iOS 9.3.3 to users worldwide. The latest update is compatible with the iPhone 4s or later, iPad 2 or later, iPad mini or later as well as with the fifth and sixth-generation iPod touch. iOS 9.3.3 is a minor update that brings under-the-hood updates and stability improvements. Apple recommends that all owners of compatible devices should upgrade to the latest firmware. If you are interested in the security content of iOS 9.3.3, you can read more about it at link. Those who own a compatible device can upgrade to iOS 9.3.3 either through iTunes or using the Software Update mechanism of their phones and tablets. Let us know if you experience any problems with the latest update in the comments section below this post.